sore | Have YOU Ben Starr Struck? Have YOU Ben Starr Struck? I’m usually a pretty healthy person and I haven’t had the flu since I was a kid. Still, I almost always get the flu vaccine each year because my allergist insists on it. This year, because of a crazy travel schedule and a constant stream of visitors since Thanksgiving, I hadn’t had time to get vaccinated yet. But flu season came more than a month early this year, and my name was in the cards. I was the last to get it in my house, thankfully, so I was able to nurse everyone else through the worst of it. But then it was my turn. I am documenting my bout with the flu here, in case anyone wants a description of what this year’s flu is like. Of course, the infection varies dramatically from person to person, so if you have the flu, you shouldn’t expect your experience to run exactly like mine. I have the luxury of working from home, so I was able to take extremely good care of myself. Your experience will vary based on your immune condition, how much rest you get, your age, your own health conditions (asthma, etc. ), what drugs you take on a regular basis, etc. First the throat. I made a strong toddy by boiling lots of grated ginger and some black pepper in water, covered, for 15 minutes. Then I strained it off. This is the base for the toddy. To it I added 2 big spoons of local honey, the juice of 2 lemons, and a splash of brandy. I drank a big bowl of that slowly. Then I sprayed my throat with propolis (the dark stuff that bees use to seal the cracks in their hives against insect and bacterial invaders…it has potent anti-microbial and anti-viral properties) and took the hottest bath I could stand. Then I took lots of Vitamin C and zinc, and Nutribiotic GSE, which is a wonder remedy my childhood doctor introduced me to. It’s made from the extract of grapefruit seeds, and is so potent that it’s being used to sanitize water supplies in South America and treat HIV in Africa. You can get it at most natural food stores (except the chains like GNC) and it comes in both liquid and tablet form. I used to swear by the liquid, but it’s incredibly bitter and most people don’t like it, so I only buy the tablets now. I took 2 tablets along with some Benadryl to help me sleep, and I slept for 12 hours. Monday my fever was up to 102F, so I took ibuprofen for the first time. I normally like to let a fever run its course as long as it doesn’t get out of control, but high fevers are dangerous. And the body aches had become really bad. Monday I learned that 2 friends were in the hospital for pneumonia related to the flu, and another diagnosed with pneumonia was turned away from the hospital because they were full, so I started taking Mucinex DM, which is an expectorant that helps prevent mucus from accumulating in the lungs, and also contains a cough suppressant. The active ingredient in Mucinex is guaifenesin, the extract of secretions from the guaiac tree, a native tree to North America, and the native Americans have used it for centuries. I don’t like guaifenesin because it makes me feel very “fuzzy” and somewhat dizzy. But there’s no denying its effectiveness. And this is not the time to take chances with pneumonia, especially when the hospitals are full! Tuesday my fever was back down to 99F without having taken ibuprofen in 18 hours, so I took that as a good sign. (My partner’s fever took the same course…99 one day, 102 the next, 99 after, then he ran no fever, so I was looking forward to being fever free in a day.) My coughs were loosening chest congestion, which was a good sign. The body aches continued, and so did the hot baths. My fever was gone by the evening, but I didn’t feel any better. My skin was incredibly sensitive, particularly on my sides. Just wearing a shirt felt uncomfortable. Wednesday my temperature was 98.1, which is about normal for me. But I still “felt” like I had fever…I had the drawing aches in my joints. Also, I started sneezing a lot. I kept eating smart and taking vitamins, Nutribiotic, and Mucinex. Lots of liquids, primarily water and a mix of fresh pomegranate and cranberry juices. Wednesday night I felt worse than I had the entire time, even though my fever was gone. I also had to run a few unavoidable errands. Wednesday night my head was packed with congestion and my nose was running like crazy, so I used a neti pot to help clear my sinuses. I continued sneezing and coughing up stuff. Thursday was the 5th day of the flu. I felt worse today than I’ve felt so far, which was bizarre to me because my temperature had been normal for 24 hours without taking any fever reducers. But I still had the body aches I normally associate with fever and my head was very congested. My body, particularly my sides, were still incredibly sensitive. Around 2pm my temperature was 99F and it gradually rose to 101F by 8pm, so my fever had relapsed, unfortunately. I took ibuprophen, Mucinex, cough medicine, and slept for 12 hours. Friday I woke up with 99.5 of fever while still laying in bed, which rose to 101F after being up for 15 minutes. I called my doctor and he said there was no need to come in unless I couldn’t get the fever to break. I asked if I should be taking Tamiflu, and he said that the anti-flu medications are most effective when started within 2 days of the onset of symptoms. (This is why it’s important to go to your doctor as soon as symptoms begin if you are a high-risk patient.) The weather has warmed up in Dallas (72F!) so I was able to sit outside in the warm sun, which felt really good. I’m pretty upset that the fever relapsed, but I hear from many people that this is common with this flu strain. I took ibuprofen in the evening and the fever went away. I slept 12 hours that night. Saturday I woke with no fever, but it’s cold and rainy again in Dallas. I feel tired, but it may be due to the 12-hours of sleep. I’m staying on the couch, drinking lots of water, and editing a year’s worth of video backlog that I’ve been neglecting. Saturday marks the 1-week anniversary of my first symptoms, and is the first day I felt close-to-normal since then. Sunday is the 9th day of the flu, and other than a cough, I have no other symptoms. My on-the-couch flu symptoms lasted 8 days. The cough and chest congestion lingered for an additional week, which I hear from friends and fans, is very typical. 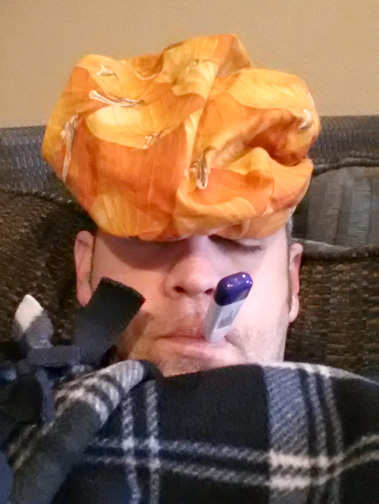 If you are reading this post because you think you may have the flu, please be very cautious. I read on the CNN website that the CDC says up to 49,000 people could die in a bad flu season. And this year’s strain, H3N2, has a history of being particularly virulent and severe. A healthy 17 year old boy in the town next to me died last week from the flu…AFTER his fever broke and he was feeling better. (He actually died of a massive internet staph infection which bloomed when his immune system was suppressed from fighting the flu. Almost all of us have antibiotic-resistant staph living in our noses and on our skin, so similar scenarios are possible.) Hundreds of others have died already and we’re only 5 weeks into this flu season. If you are still healthy, please get a flu shot, not just to protect yourself, but to protect your family and friends. If you get the flu, you WILL give it to them. Sanitize your hands regularly at work and home, and avoid close contact with coworkers who are sick. Theme: Coraline by Automattic. Proudly powered by WordPress.